PANSPACIFICFLIGHT has now joined the $10 million club in North America. The son of The Panderosa has left 356 foals of racing age who have won an average of just over $US28,000 in stakes. Even if you exclude his biggest winner (Fridaynightflight, $US580,000), his average is still more than $US26,000. Panspacificflight has left a total of 156 winners, 100 two-year-old winners, 78 sub-1:55 milers and 28 horses who have won more than $US100,000 in stakes. And 2014 was a big year for him. His two-year-olds won $US440,000 in stakes, placing him second among Indiana-based sires behind Rockin Image, but ahead of other prominent sires Always A Virgin and Real Desire. This year Panspacificflight is standing in North America at Schwartz Boarding Farm in Ohio. 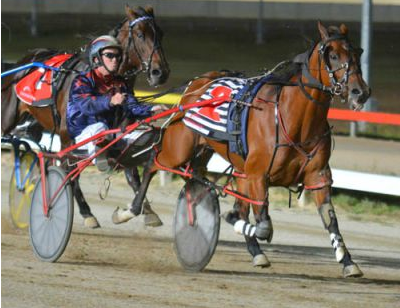 MACCA LODGE-BORN Mister Lennox, the winner of the $A30,000 Tasmanian Derby in Hobart in March, is the latest feature race winner bred by the famed Tuapeka Lodge at Lawrence. Known here simply as Lennox, the Changeover colt was educated by part-owner Dan Cummings before being put through the first Macca Southern Geared Yearling Sale in 2013. Tuapeka Lodge subsequently sold him for $22,000 as an early two-year-old to prominent Tasmanian owner Barry Cooper, who was delighted with his biggest win in harness racing in the Group 3 derby. “I set out to pick what I hoped would be my best horse to race with my children and it looks like I succeeded,” he said. Trained by Juanita McKenzie, Mister Lennox has now won four in a row and takes his record to eight wins and $A56,000 in stakes from 14 starts. He’s out of the Falcon Seelster mare Tuapeka Osprey, who has been resident at Macca Lodge along with her half-sister Letatalk for several years. They are out of Seamoon (Smooth Fella-Maureen’s Dream) and descend from the Light Brigade mare Mains Lady, one half of the Tuapeka dynasty that has produced winners from juvenile champion Tuapeka Knight (probably best-remembered these days as the sire of an unlikely quinella in the 2002 New Zealand Cup) to Ideal Scott (who has won five Group 1 races, on both sides of the Tasman, and about $750,000 in stakes). The two mares at Macca Lodge have been doing their bit to keep the family to the fore with $100,000 earners in West Australia — Tuapeka Osprey’s Bettors Delight gelding Tuapeka Kahu has won a dozen races, while Letatalk is the dam of four-year-old Mach Three gelding Machtu, a likely Interdominion contender in Gary Hall’s Perth stable. 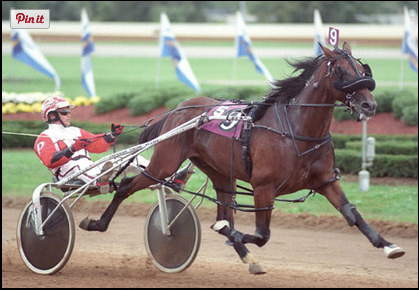 Tuapeka Osprey was leased to Macca Lodge for two seasons and produced Panspacificflight filly Pantastic, who has had one start as a two-year-old, and an American Ideal filly. The mare was sold late last year to Paul Bielby, who once bred a horse you may have heard of called Christian Cullen. Another mare at Macca Lodge from this family is Jamie, who won seven races for the McIntyres. She has produced a promising Panspacificflight two-year-old, Ted Cady, who qualified in November and has been put aside until next season. Footnote: Mister Lennox wasn’t the only good winner to go through the 2013 Macca sale. Two others have become multiple winners in Australia — Glenisla, the Panspacificflight filly, who has won five times for stakes of close to $A25,000, and Beaudiene Bill (Changeover-Beaudiene Rarity), who has won six races and stakes of $A34,000 in New South Wales. (The latter was named Beaudiene Barret here, but the new Australian owners, probably not All Black fans, may not have appreciated the play on words).